The St. George Library Center of The New York Public Library was opened on June 26, 1907. 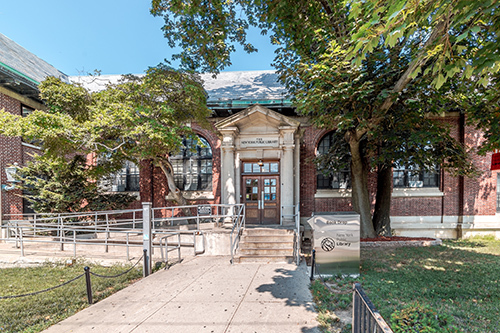 The largest library on Staten Island, it was designed by Carrere and Hastings, architects of the neighboring Borough Hall and County Court House. The Main Reading Room features an impressive beamed ceiling of massive timbers, which were obscured for thirty years. We have exhibition space in our Reference Room available. Call us for details! Rising behind the circulation desk are stained glass windows created by New York artist David Wilson, which reveal a spectacular view of the New York harbor through the clear lower panes. The branch is air-conditioned and fully accessible to people who use wheelchairs. A spruce-up project in 2001 provided more PCs for public use, a computer lab in the Center for Reading and Writing, and new carpeting and paint throughout the building. The Children’s Room now occupies the entire second floor, having been expanded and renovated into a bright and spacious area in early 2010, in a project funded by an anonymous donor. The new layout includes a special area for hosting school visits and toddler activities, and enhanced seating for newborns to children 11 years of age. More desktop and laptop computers are available for children, parents, and caregivers. The collection is large and diverse, ranging from board books for babies, picture books for reading aloud to young children, Easy Books for beginning readers, and strong collections of non-fiction, 5th–6th grade fiction, and book/CD kits. The shelving showcases many CDs of children’s music, DVDs of popular films and television shows for children, and magazines to borrow. There is a also basic collection of children’s materials in Spanish. We offer a wide variety of programs for children: Story Hour, Toddler Time, crafts, crocheting, computer classes, and video and board games. We also host special events featuring outside musical and theatrical performers. 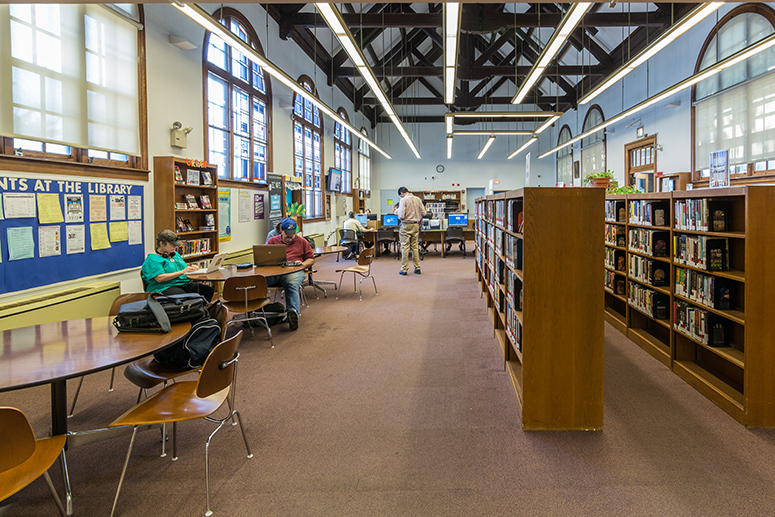 Inside the St. George Library Center on the lower level is the Teen Library, the only such large, designated space for young adults, ages 12–18, among Staten Island public libraries. Just for teens, the spacious room is a bright, colorful space with large collections of books, CDs, DVDs, graphic novels, and magazines specifically for this age group. Comfortable casual seating, 6 desktop PCs, and 12 laptop computers attract teens from the several near-by high schools and around Staten Island. The room hosts classes from local schools and community organizations, and presents a full, year-round schedule of programs such as, video gaming, writing workshops, Yu-Gi-Oh tournaments, crafts, science programs, film/DVD programs, and social and book groups. Generously funded by the Wallace Foundation, the Teen Library has a maritime motif.